"Visual FoxPro 9.0 executable file has stopped working"
I am a user of a prepackaged software written in Visual FoxPro (working under Windows 8.1). Whenever I run this software it crashes with "Visual FoxPro 9.0 executable file has stopped working". After browsing several FoxPro forums, I made sure the application's folder contains the 4 essential "runtimes" (actually gdiplus.dll was missing, so I copied it from the Windows\System32 folder). However, the software would still not run. Does anyone have a clue what am I missing? I appreciate any comments or help. RE: "Visual FoxPro 9.0 executable file has stopped working"
Do you have a backup of the application that you can restore just the runtime files from? You should have a setup that installs the EXE with runtimes. Don't just copy around an installation folder of a software, that's not working very generally, not only for FoxPro based application. If the gdiplus.dll is not in the working directory it's taken from syswow64, taking it from system32 means taking the 64bit version, that doesn't help. Any way it is, copying a runtime directly into the application folder from a system directory where it's found any way won't make a difference. If it would be the gdiplus.dll there was a hotfix once, as the gdpiplus.dll had a security issue. You talk of 4 essential runtimes. Are you sure you didn't miss something else? 2. gdiplus.dll: which I “transplanted” from The System32 folder. I should note that I do not have any control over the installation process, as the software maker provides an Installer, which is supposed to do all the work. Apparently some parts are missing from the installation process. What can I do to get over this? Scott24x7, I think the DLL is not corrupt because the software was able to install and run on an older machine. vfp9t.dll only is necessary for VFP DLLs having a COM Server, this isn't necessary for you. gdiuplus.dll: Well, this should be in C:\Windows\syswow64. If a gdiplus.dll is missing from there you can't use the system32 dll, as that is a 64bit dll. With a grain of doubt, as much time has passed since then and the normal Windows gdiplus.dll should have the security patch in it already and be usable with VPF9. There might be something else missing like an OCX, and if your vendors' installer doesn't provide that, is there some dependency with MS Office, for example? Using office automation or Outlook automation. All of them seems kind of antique as they are dated to the years 1998-2000. I have no knowledge of any dependency with Office, though that might not indicate there isn’t one. I guess the software should allow users to export stuff to Excel (or other office applications) but I am not sure this qualifies as “Dependency”. I don’t think the software includes any Office automation modules. Are they of any use?! I don't think the errorlog.dbf is of use, as this "stopped working" message likely comes before the main code of the exe runs. Are the OCXes registered? It's insufficient for OCXes to just be in the same folders to work. What type is the installer, is it a cmd batch file or an executable or msi file? I get the impression it didn't run with eleveation and wasn't able to do all necessary setup steps. You may be onto something, because the Vendor’s support also asked me once if the installation process had Administrator privileges. I started the installer (more than once) with a right-click and then chose “Run as Administrator”. Maybe this was not enough?! I had the impression the installer had to start other installation sub-processes (such as updating “Redistributable” stuff from Microsoft.com), but I am not sure these “Daughter-processes” or all installation stages inherited the elevated privileges I gave to the installer file. The installer is an .exe file. I have no idea about registration of the OCXs. How can I check that? It sounds like secondary setup processes started by the main setup don't run elvated. You might get this going, when you first start cmd.exe in adminstrator elevetion and run the setup from there. Even if you run an EXE "as administrator" you get the elevation prompt dialog (or admin login, if your account is no admin). You get that elevation dialog, when starting the admin shell, too, but processes you start from it run elevated. A setup will ask for elevation itself if its name contains the word setup or update. That's a mechanism which was introduced for compatibility reasons, the official way for an executable to ask for elevation is via an embedded manifest declaring the need for elevation. From what year is the setup and what target OS was it created for? You can't expect things to run forever, that also applies to setups themselves. Checking OCX registration: Hardly doable without knowing the OLE Classnames, but in short, you would need to find registry keys in the HKEY_CLASSES_ROOT branch. OCXes might also need some support libraries, DLLs, if that all isn't known this sounds like the vendor has lost some knowledge they once had, is the original developer still working there? Is this software so old, that it's not maintained anymore? You can run old OCXEes like the MS common controls even in Win10, but you likely need an additional C++ runtime dll even older than that for VFP9, not instead but side by side. Sounds to me like you might do better logging in as administrator, then running the installation program - that way you are already properly elevated and less likely to run into problems. No Griff, not since Vista, the difference of starting processes as administrative user is that an elevation prompt only asks you to confirm running the process, while a normal user gets a login prompt. But processes started by an elevated process still don't get elevated themselves and if they have no embedded manifest asking for such elevation will run with normal elevation and not be able to register OCXes, for example. Since Vista, so since over 10 years the adminstrative accounts - even the one named "Adminsitrator" are not automatically creating all the processes they start elevated, this is part of the changes introduced with UAC in Vista. That's also a reason it's not enough to have a setup starting further subsidiary setups. It sometimes can work to change UAC to the lowest level and then back, but changing UAC levels can also mean access to system folders and registry is not redirected at installations and later is again redirected, also rendering the installation result useless. What you can try is look into the porerties of the main setup and change compatibility mode of it to XP and then start the main setup "as administrator". I did as Olaf suggested. I looked up “cmd” in the windows search box and then right click “cmd.exe” from the list and “Run as Administrator”. In the console windows that opened up I typed in the name of the Installer file, and let it do its thing. Then I ran the software, but the same old messages appeared, i.e: "Visual FoxPro 9.0 executable file has stopped working". I did notice however, that the installer did not perform any sub-processes like last time. Perhaps because the Installer recognized that they were not needed, as I already performed these steps before. “Stock Investor Pro” is the software name. As I said in an earlier post, these steps were initiated on previous installations but I do not know whether they were successful, or if they needed elevated privileges. The Installer file is dated September 30, 2018. According to the software vendor System Requirements are “Windows 8 or newer” (my computer meets the requirements). FYI: Reading all this won't help you, I just point out a scenario where the installer itself would perhaps load a .NET framework just because the installing process needs it. It likely wasn't needing this on Win8, as the .NET framework already was there to run the ClickOnce installer. In very short, if that was configured wrong this could be a reason the installer worked on previous OSes and stopped working on Win10, i.e. the installer ran on Win8/Win8.1 as the prerequisites were already there and it fails in Win10 loading the wrong prerequisites. Notice "Or later" always is a hopeful statement relying on Microsft designing their OS downward compatible and usually that's the case. Another thing you could try is to run a VFP specific runtime installer from https://github.com/VFPX/VFPRuntimeInstallers. The vfp9sp2rt.exe is for VFP9 SP2. Also, whether that works or not, you should really get back to the vendor and tell them their package doesn't install on Win10 and they need to repackage that. If running vfp9sp2rt.exe helps that's a big hint on their installer causing the wrong C++ runtime to load, I can't assume they embedded the wrong VFP9 runtime itself, but only succeeded on Win8 for the reason the right C++ runtime version already is present with the OS or Office and other software on Win8, but not in Win10. If the VFP9 (and C++) installer doesn't work, I'm out of ideas what's causing that problem. The vendor of Stock Investor should have the installer project and be able to adapt it to Win10 as necessary. Might not even be their fault but anything incompatible Microsoft introduced with Win10, that causes ClickOnce installers to need an update to work in that OS version, too. May I ask into which folder you have installed your program? Since only installer programs can write to C:\Program* folders, your VFP application can't write to these folders. This wasn't a problem with earlier Windows versions. With newer Windows versions you can install the program in c:\Program.. folders, but all the user data, including configuration files managed by VFP, must be in another folder. Thank you Olaf and Tore for your comments. I went on and downloaded vfp9sp2rt.exe from GitHub and started installing. While I was going about this, this Installer asked me where do I want the files copied to. The Installer’s default was “C:\Program Files (x86)\Common Files\Microsoft Shared\VFP\”. I wanted to be sure about this, so I halted the installation and checked if this folder exists at all. I found out there’s no such folder on my machine. Could it be that these files already exist on my machine in some other location? (Had I known the file names to be extracted, I would have done a search without bothering about this). The software installed itself on “C:\Program Files (x86)\Stock Investor\Professional”. I think there was no problem with that on older machines of mine running Windows 7 or lower. The folder “C:\Program Files (x86)\Stock Investor\Professional\User” (and all other folders in "C:\Program Files") are read-only except for installers. This is why you must always either install "as administrator" or the installer asks for permission to elevate to administrator level. Try to install in another folder outside the c:\program* structure. The files don't need to be installed there, and indeed the best place is where the application is installed. But this installer registers this version of the runtime for every VFP9 SP2 application and in such a case that folder will be created and is the default path. I already said what will be installed, just like the name of this setup tells you, it's the runtimes, I expect this to fix mainly the correct C++ runtime to be installed for your software to run. So please just install there. Don't think too much about this and if you don't trust me, then why did you come here at all? Also, if you're asked with a default, that normally means you have free choice and the default is no bad idea. Tore might have a good idea, but I don't see how insufficient write access into the program file folder would lead to your error, and as you tell the software is made for Win8 or later that would also have been a problem on Win8. But since Vista, the OS redirects writes (and reads) into read-only system folders like program files to a user profile folder, but that doesn't cause it not to work. Having the wrong C runtime could easily cause that Letting the EXE code jump to a wrong address in the C runtime DLL. If that still doesn't work, the only other reason I can think of is having a bad setup download. The whole setup has corrupt files, maybe the application EXE or any DLL in it doesn't work. your software was running smoothly before? Have you now reinstalled on an other pc? Did you check with the vendor under which version of VFP this software was constructed? And are you sure this is VFP9 or VFP9SP2? Are you sure the runtimes tally with the version of your software? I ran and vfp9sp2rt.exe and installed the runtimes to the default directory. Then ran the software and got again the message “Executable has stopped”. At this point I started fiddling with stuff that came with software, and ran an “Update Utility” that is part of it. To my knowledge, this should have only updated the database and not the code. Anyway, the Update Utility tried to perform something but crashed with a FoxPro message: “Fatal error 171 while attempting to report error 171”. That’s where things stand at the moment. Koen- The software ran smoothly on older machines of mine running Win 7. I checked with the vendor: Support says the software was constructed under VFP9SP2. OK, the last shot on this: As you now installed VFP runtimes into the default directory given by the runtime installer, please delete them from the application installation directory C:\Program Files (x86)\Stock Investor\Professional. Especially delete the DLLs which now have their place in C:\Program Files (x86)\Common Files\Microsoft Shared\VFP\ so VFP really takes those and not any local ones, of which I assume some are broken. You may start only deleting the msvcrt71.dll within C:\Program Files (x86)\Stock Investor\Professional or C:\Program Files (x86)\Stock Investor\, but since the runtime installer registers the VFP dlls this'll let the Stock Investor exe find them, if there is no such dll in the software folder. You may also compare the DLLs, do you see any differences? Again for clarity as I was ambiguous previously: Keep the DLLs where the vfp9sp2rt.exe installed them, delete them from within C:\Program Files (x86)\Stock Investor\Professional or C:\Program Files (x86)\Stock Investor\ Even if there is no difference, the ones vfp9sp2rt.exe installed are also registered and I know this setup has the correct VFP and C++ runtime DLLs, too. Olaf- I moved the “runtimes” that were still in “C:\Program Files (x86)\Stock Investor\Professional” from this directory to another drive. I did this one step at a time. After I moved the first three files, there was no change in the computer’s behavior, i.e “Executable has stopped”. Only after I removed VFP9RENU.dll did I get a new message from Microsoft Visual FoxPro saying: “Visual FoxPro cannot start. Could not load resources.”. IMHO that message should sound strange, as another version of VFP9RENU.dll exists now in “C:\Program Files (x86)\Common Files\Microsoft Shared\VFP” (I double-checked that). I should note though, that although this DLL’s name is basically the same, in one directory was it named “VFP9RENU.dll” and in the other it is “VFP9renu.dll”. I don’t know if that means anything. 1. foxhelp9: Same name, same size. In the “Stock Investor” folder it is dated 5 years earlier than in “C:\Program Files (x86)\Common Files\Microsoft Shared\VFP”. 2. foxhhelpps9.dll: Same name, same size. In “Stock Investor” it’s 5 years older. 3. gdiplus.dll: Same name. In “Stock Investor” it’s older and bigger (I copied this file myself previously to “Stock Investor”, as I noticed it was missing there). 4. VFP9r.dll: Same name, same size. In “Stock Investor” it’s older. 5. VFP9renu.dll: Name differs a bit- “VFP9RENU.dll” vs. “VFP9renu.dll”. Size is the same. Dates also differ a bit: in “Stock Investor” it’s newer 15/10/2007 vs. 21/09/2007 in “C:\Program Files (x86)\Common Files\Microsoft Shared\VFP”. Koen- I shared with you the installation file from my Drive. I appreciate very much the time you put in trying to help me sort out this mess. Whether the name is upper or lower case won't matter. File dates simply change when files are zipped/unzipped, when they really have a difference a checksum like md5 would differ, the same size already is a strong indicator they are same files. I assume if you put the VFP9RENU.dll from “C:\Program Files (x86)\Common Files\Microsoft Shared\VFP” into “C:\Program Files (x86)\Stock Investor\Professional” you'll be back to the “Executable has stopped” error. Then I guess it's that EXE itself, that's defect. If a new download of the software setup doesn't work, I wonder if Koen will get the same error. If not, the only other vector left over is OCXes, but I don't remember missing OCX registrations to cause such a fatal error, in the worst case you get a message you can ignore and a form runs without that control, which can cause a lot of follow up errors, but no fatal error and all-in-all nicely points out which OCX isn't registered. 1) StockInvestorPro___Data Updater for "C:\Program Files (x86)\Stock Investor\Professional\si_start.exe"
2) StockInvestorPro No Data Update for "C:\Program Files (x86)\Stock Investor\Professional\si.exe"
3)Stock Investor Pro Utilities for "C:\Program Files (x86)\Stock Investor\Professional\si_util.exe"
use a search file like e.g. "everything" to be sure you have renamed and removed all files. When you HD is cleaned, than use the installer again and let it install in the default directories. Koen- I’d like to get a little bit specific. I hope you’re Ok with that. By “repeat all vfpruntime“, do you mean re-run the Installer Olaf recommended? Should the Runtimes in “C:\Program Files (x86)\Common Files\Microsoft Shared\VFP” be uninstalled first? Could they be uninstalled, or normal “delete” should do? Should I uninstall (or delete) the Runtimes before or after I uninstall Stock Investor Pro? The same question goes for reinstallation. Would the order of uninstall and reinstall matter at all? By “search everything” do you mean search for specific folders (like “Stock Investor”)? Otherwise there may be too many files and file types to look for and delete. Or did mean exactly that? Another issue is privileges: should reinstallation be done with elevation? By the way, if my user and password are needed to ascertain the software works on your side, I’d be happy to provide them. Thank you Koen and Olaf once more. Right-mouse on the icon and change the compatibility to a lower version of Windows. If you want to get the best response to a question, please check out FAQ184-2483: How to get the best response from the forum first. the runtime files do not have to be 'uninstalled', run an uninstall of vfp9SP2 and after that delete any runtime files on your pc. delete also VFp9.exe from your HD. By 'search everything' I mean your complete HD, all directories. Tool "Everything" is a fine tool to do this. No need for password a.s.o. programm works as expected. Or is it that your program errors with "Visual FoxPro 9.0 executable file has stopped working". on a certain place in the exe? In that case provide me with the username an pw and indicate where and when the error occurs on your side. Koen, it's not really a good idea to just delete the files vfp9sp2rt.exe installed and registered, you will cause some orphaned registry keys pointing to missing files. Such actions cause more problems than they solve. It's true you sometimes need to go the cumbersome route, but as long as the software has a good entry in the system and an uninstaller, that should at least be able to remove all necessary stuff from the registry, too. Otherwise you'll need to advise to go through the registry, too. I'd use available uninstallers first, that means pick the software from the list of installed programs for uninstallation and after that delete what remains after they ran. I don't see how that can help a lot, the vfp9sp2rt.exe once installed would enable any exe compiled with vfp9 sp2 to run, unless it has more prerequisites than those covered by the runtimes it installs, and that's all the msxml versions needed for VFP specific xml commands, the vfp9 runtimes for both executables and DLLs (multithreaded dlls) and gdiplus and c++ runtime. And that's quite solidly working, unless some foxpro executable has a broken vfp9r.dll that overrides the usage of the centrally stored dll. Do you have the msvcr71.dll in C:\Windows\SysWow64? Notice, really exactly that name, there might be similarly named dlls with other numbers, that'll be C++ runtimes necessary for other software or even Windows itself, eg 100,110,120 are normally in there, too. Don't touch those. You may look into it further using a right.cklick->Properties and looking for the product version in the details tab. I have one with Version 7.10.3052.4 in SysWow64 and it's not in C:\Program Files (x86)\Common Files\microsoft shared\VFP, it's alos not necessary there, that VFP folder is for the DLLs and EXEs, that are registrable and which are registered. I am sorry if I was unclear, but I said exe (use windows uninstaller) Of course an exe sould never be deleted by deleting but should be uninstalled, however it occurs that sometimes the uninstaller unstalls from the registry but not physicaly removes the file. That should also be done in this case, just to avoid there remain no old files on your HD. Also ofcourse instead of removing, a renaming is more to be advised. I haven’t done yet any deletions or uninstalled anything. Was planning to do that over the weekend. I looked up msvcr71.dll on my computer and found there is one in SysWOW64 with Product Version 7.10.7031.4 and another one in “C:\Program Files (x86)\Stock Investor\Professional” with Product Version 7.10.3052.4. Does this get us somewhere? Yes, that get's us somewhere, because likely the version you have in SysWow64, while being newer, is causing the errors. So rename the one in SysWow64 and see if that makes si.exe use the local DLL, then vice versa, rename the SysWow64 dll back to normal and rename the one in the Stock Investoer\Professional folder unusable. Different versions of a DLL might have downward compatible classes and functions inside them, but at different entry point addresses, and that difference can cause a fatal error for entering a dll at the wrong addresses. The mechanism isn't that hard coded adresses, a DLL exports symbols for its entry points so two different versions are usable, but I only know for sure the older 7.10.3052.4 version is working in my system. Now, there might be any other software which needs the 7.10.7031.4 version, so don't delete it. I'm almost sure the way you have it the local old version 7.10.3052.4 will be used, as the si.exe will need the c runtime even before looking for the vfp9r.dll Foxpro runtime, at its core the EXE starting point is still a c++ main() function that starts up the VFP runtime and then runs VFP code, so it matters where that part of the EXE looks for the msvcr71.dll first. If the renaming of the one in SysWow64 helps, that shows it looks there first, which means you could only run VFP9 applications on systems not having a later DLL in SysWow64. That would be a threat to VFP application. I can't really imagine that. But your situation doesn't work, so it indicates that already. Could be one of the tow DLLs is defect and not just the wrong version. That would complicate things. Olaf- I renamed the two files (one at a time) but the software failed on both renames. Oddly enough, the rename operation in “C:\Windows\SysWOW64” required elevation (which I granted) to complete. In the other directory this was not required. The end result was nevertheless the same. That elevation need is not odd, when you act on a system folder you need elevation, that's the major resons installers need elevation to really install something and not just put files into redirected folders or virtual registry and "seem" to work. It was my major concern, you could try one more thing and put the 7.10.3052.4 version into SysWow64. But I doubt it'll make a difference. I now think no matter what you do, the EXE itself, the si.exe is defect and there's nothing we can do in the environment and from outside to fix that. please mail me the username and pw in order for me to check Olafs's assumption quote I now think no matter what you do, the EXE itself, the si.exe is defect and there's nothing we can do in the environment and from outside to fix that. unqoute Also please indicate on exactly which occurence the application errors. Your suggestion is sensible. This trial may indicate if the fault lies within the installation file. I will send you the data over email for better security. Have you even tried my suggestion? nothing wrong with the software it can be installed on Win10 64bits. I think there is something 'rotten' on your pc. Is this the only .exe built with VFP running on this pc? OK, one thing I didn't yet think of is a broken external file like the foxuser.dbf. Actually, something too often causing problems, that we shouldn't overlook that. But because I also don't have much use of it in my projects I add a config file suppressing the generation of that DBF and I often forget about its existence. Koen, you know what I mean, you don't need to read the rest, just if your getting back to this before Eylon you could simply see whether a foxuser.dbf is created. A corrupt fioxuser.dbf could also make the EXE fail in a very early stage with a fatal error. An EXE compiled from VFP source code does create such a DBF, and that happens even before the first line of VFP code executes, so just like loading the C runtime and loading the VFP runtime and starting these things up to be able to execute the compiled VFP code this happens before any VFP code of the EXE itself that could cause that fatal error is. The reason is of course not just the generation of such a file but reading it. There is a way to configure this to not be created, but we don't yet need to get there, it would also suffice if it's regenerated because you delete a corrupted file set and the next one likely will not be broken. C:\Program Files (x86)\Stock Investor\Professional. It could also be in both when the vendor added a foxuser.dbf into the program files, but then you easily get into trouble when there still is only read permission and write operations create the file in the \VirtualStore\ folder. So please look in both places and delete the files in both places. The next step is you could create a text file and write RESOURCE=OFF into it, save that as config.fpw in the EXE folder, that'd prevent that files to be created. But before you do that, the software might make use of it, so there is no reason to avoid it, once it is generated correctly and works there always is the risk of it becoming broken again, but it will not happen so regularly and the fix will be to delete it. What you might win keeping it is the software remembering your window position or positions, that's one of the features stored in that table. The installation did not construct a Foxuser.dbf in the installation directory. The software is installed in the 'normal' place by the setup. The software runs like a charm. The error message "Visual FoxPro 9.0 executable file has stopped working" is not a VFP error to my opinion, it is more a WIN error. The vendor did not add a foxuser.dbf to the installation files. Let us wait what Eylon comment is on this situation. Besides Eylon never indicated where / when the error occurs in his app. >The error message "Visual FoxPro 9.0 executable file has stopped working" is not a VFP error to my opinion, it is more a WIN error. No, it just is the way a C000005 error is shown in Win8(8.1 and 10, it is a fatal error of the msvcr71.dll. I'm pretty sure abouit that C5 errors show up differently and yes, they are not VFP errors directly, they are a C++ runtime error, but in this case of an old C++ 7.1 runtime that's likely only installed for the VFP app. I assume the installer is a clickonce installer downloading the latest C++ 7.1 runtuime, this Eylon found the 7.10.7031.4 version. C5 errors can occur from a defect foxuser.dbf or a corrupt frx, any table corruption can cause this, besides the less harmfule "is not a table" error. It would also perfectly explain why the error stays reluctant and only doe snot occur, if the VFP executable even doesn't start up the C++ runtime. What I remember from a detail discussion about the difference introduced with Vista is, there is another level of error exception handling intended to give a user friendlier message, but as it is with such things, it hides details. There is the appcrash event and this also will be logged into the Windows Event log. That's a place Eylon could also look into, besides a vfp9err.log should also be created just as usual with C5 errors. Did you look into the VirtualStore Folder for a foxuser.dbf, too, Koen? Besides, as your PC likely has VFP itself installed, you have a bigger difference in already registered working C++ and VFP runtimes and some of the OCXes, that come with VFP and are allowed to be redistributed but don't usually exist in Vista or later. There are very few dependencies of VFP with the OS, there are a few kernel functions used for memory management, but surely they are not broken or nothing works. Oh, and before I forget again, thanks for looking into this even at your weekend. Me and Koen were communicating over email, and Koen told me he was able to make "Stock Investor" fully functional with the login credentials I gave him. IMHO that would mean that the installation file is not broken. I guess some other thing on my PC is hindering the software. I could not determine if your discussions about foxuser.dbf or the other stuff are relevant to my case. Are they? Anyway, I have accepted Koen’s offer to help me reinstall stuff, and see what happens (thanks a lot, Koen, will send you an email shortly). We’ll probably do that in a couple of days and report about our findings here. If anyone wants to suggest other remedies in the meantime, I will gladly try them too. Mike, sorry for not reporting earlier regarding your suggestion. I right clicked the software's EXE file but was not able to find any menu item resembling “Compatibility Change” other than “Troubleshoot Compatibility”, which resulted in a never-ending search process that I had to terminate. You can still do what I asked and look for the foxuser.dbf, even after you uninstalled everything, this is a file generated by the first run of the software and so it's not among the files insatlled and thus deleted with an uninstallation. I think it still is a good explanation as no matter what else you tried if that file was generated and broken quite early form the first usage, this doesn't repair itself with any further installations and manual renaming of DLLs and de- and reinstallation. But one thing is good to know, your software download is ok. Maybe Koen will get it to work after cleaning your system a bit from leftovers in the file system and maybe also in the registry. Just, that I'm clueless what else is causing that problem. You only get fatal errors if either the C++ runtime or something the runtime processes has a defect, eg a table or report or form (even the ones embedded in EXE, you can have bad luck with a compilation) with errors that let the runtime work on a file offset not existing, anything like that. Since the installation works for Koen, there seems no inherent defect with anything the setup installs. No idea what else could cause your error. A look into the Windows event log and a vfp9err.log might make more clear that it was indeed a C000005 fatal error of the C++ runtime and may point to a line of code, that could only help the vendor to see what happens there, i.e. what file is processed at that point. But you won't be able to see anything from the event log yourself, it's too full of messages from anything else, too. Before I could explain what to look for, I'd rather need to look myself what to look into, the Windows event log is a bit more complex than just a text log file. If Koen does a remote session with TeamViewer or Skype or whatever that'll help better than any further instructions for you. Hi Guys. Just a quick update. Koen did some hard work on my PC: renaming files, copying some of them to other locations, and finally uninstall and reinstall. So… I am getting an Upgrade to Win 10 (now I am running Win 8), and will try again. don't upgrade to Win10. Instead do a clean installation of Win10. Just talked to the technician at the shop and he said the same. I won't be able to complete this project this week. What I did, was to buy a new SSD HD, and install Win10 on that. I also bought an external cabinet for my old HD, and connected it via USB. After a while, when I know that everything works as expected, I will reformat the old HD and use it for backup or as a portable media. I think Tore gave you a very good solution. Meanwhile buy a cheap lowcost win10 laptop and install only SI on that pc. No need for an extra browser, nor an antivirus as this is all implented in WIN10. When your old PC is executed with a SSD as Tore advises you can always backup from that lowcost laptop. I meant the icon, not the executable. I am getting the same menu and same process. Does your suggestion function under Win8.1? “Troubleshoot Compatibility”, which resulted in a never-ending search process that I had to terminate. Such a thing points out you may have fiddled too much with OS files and reg keys already, manually or using cleanup and repair tools. Seems you removed a portion of the OS itself. Moving to Win10 will be a good move to get a stable system again. RIghtclick on the icon -> Properties ->Comtability (Tab) -> click on the Checkbox (translated) "Execute this program in comptability modus for" -> select from the combobox (which becames enabled after activating the checkbox) one of the displayed options. Afterall same as you, only a little bit different path to get it and a little bit different prompt. Maybe we have a different WIN(10) version? This option was not tried when we had a TV session, would you care / be able to do it now? 1. 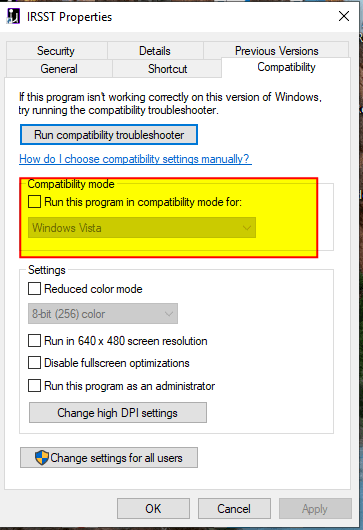 I was finally able to find what mike was referring to (compatibility options). As is with Koen, this menu is accessible through a slightly different path on my machine. Anyway, what do you guys suggest as the “best” OS to choose? I have a selection range from Win 95 to Win 8 (and also XP and Vista). I’ve already tried Win 7 and got Error #171 from FoxPro (which occurred also before I touched this). 2. I looked on some SSDs on the market, but then I figured I should check what kinds can my hardware support at all. According to the following page from the manufacturer Link my PC can have “Up to 1TB 5400 rpm HDD or 128 SSD”. I sent Lenovo a query about that, but still waiting for someone to get back to me. Any ideas where I can verify that? If your PC can use a 1TB HD, I'm 99.99% sure that the same goes for a SSD. If you go for SSD, and I'm with Tore - I see no reason it should only be covered for 1/8th of the size, your minimum OS should be Windows 8, as previous would waer your SSD more than necessary. 'Only since Windows 8 the handling of SSDs is friendly towards their lifetime and performance. If a software needs an older OS a solution is a VM with that OS, on that idea XP mode was invented and you don't depend on the OS managing something like that, you can always do that yourself. Emulated hardware can be treated anyway, the final treatment is done on the host OS level, so in that case a Win8 host system can run XP, Vista or Win7, you can also run later OSes on a host, for my first Win10 I was using the Betaversion download and installed that in a VM on Win7. And indeed you can safely run XP as you can configurte a VM to always go back to it's initial state when you restart it. Software making use of a database server installed on the host or a server in the network would not need to keep local file updates, this way you can have halfways safe XP systems, though it's always risky to run them when they become the initially infected machine they can infect host and other real machines, too. But your system seems to be worn out from too much interfereing with it. There are lots of half baked hints in reg key meanings, performance tuning and security hacks out that, which do more harm than help and -sorry - but you halfways proved you're not good at following instructions as given. Might be partially about circumstances, but even tools like the popular ccleaner can do things not really good for the stability of a system. When you get errors in software working on other computers, that might be hardware, but in most cases it's softzware problems from manually fiddling with the system, forgetting to do regular system updates. VFP9 shows no deficiency on any Windows version, I notice difficulties with General fields, but it's recommended to not use them at all since many OSes already, so I don't count that as a Win10 problem. So far in respect of VFP applications made with VFP9 I would always recommend the most recent OS. 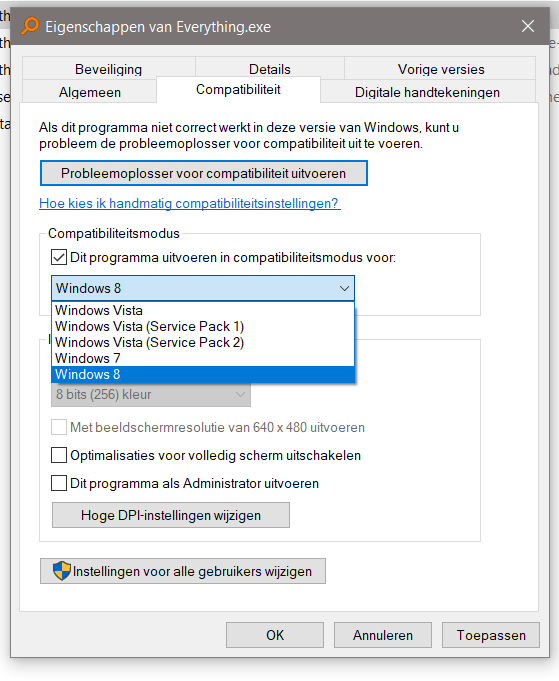 The case with your software running on Koens computer shows it's not the fault of the software installer or Windows10. VFP only uses some very core functions of the OS, the C++ 7.1 runteim and then it's own, it has very few OS dependent things, for some XML functionalities it depens on MSXML3 (CurstoTtoxml/xmltocursor) and MSXML4 (xmladapter and other classes), I wouldn't to XML Services the VFP way with the deprecated Soap Toolkit anymore, so that's less important and there are other libraries to work with XML, but indeed many MSXML library versions can be installed in parallel. Besdies that I don't remmeber much deppendencies. Ther's the topic of themes, but you can turn them off. The errors you experienced are riddling me, the major dependence is the one to the msvcrt71.dll and no more. Anything else would likely be problems of third party add-ons, OCXes, but again, as the software runs for Koen, this seems to be rooted in some problem of your system, not the Windows version, just the current condition of your system. And it riddles me, because with so little dependency on OS the only real problematic part is the msvcrt71.dll, the core functions about memory allocation adn things like that work for every application and will never be a problem or the whole system is problematic. There is no OS causing more fatal errors than another, C5 are partly bugs of the VFP runtime triggered by unexpected cases of corrupted sections of VFP files lie the dbf structure, frx structure, just lkike a ZIP file with a specifically prepared byte comnbination can cause a tool like Winzip to fail. And fixes of these types of errors are made in the VFPXr.dll runtime, not in a later OS more stable, the point is to never trust and expect certain structures to be as expeced, don't blindly follow pointers into places of a file not even existing, for example. VFP9 is the most stable VFP version and so far there is no past OS most stable for it than the current one. You could perhaps say XP was the best OS for VFP6/7 and some may already have decided Win7 was best for VFP9, but likely they'd not only say that in reference to VFP9, but because Win8/8.1/10 was not their cup of tea. Just from the perspective of security I'd always only use the latest. Some conditions can bind you, I fight with a specific OCX and my customer isn't learning from all evidence this control has to be eliminated, he's rather willing to try XP VMs, because that OCX was created at Win95/98 times. It must have been expensive, but just like first Scanners or CD drives or mobiles once were very expensive, newer devices are cheaper and better. And you have to think about investing into renewal also in things like software, there is no manual wear, but there always is aging, even in software. One last question about the integrity of your download and installed DLLs: Did you forward your download to Koen or did you just give him the download link to the software? Because it could still be just your download being defect, missing a few bytes only can let it still work in general but extract wrong files. Such errors can be a cascading effect of some single bitflips, so also HDD defects may cause this. The best way to check files is knowing their checksums and not just file date or product version. Thank you Olaf for your most extensive reply. I gave Koen the installer file itself (not the link), i.e the very same file I used to install the software on my machine. Finally I got this process moving again, and should be getting my new SSD, cabinet for it, and Win 10 in a couple of weeks. Will report back after reinstallation.